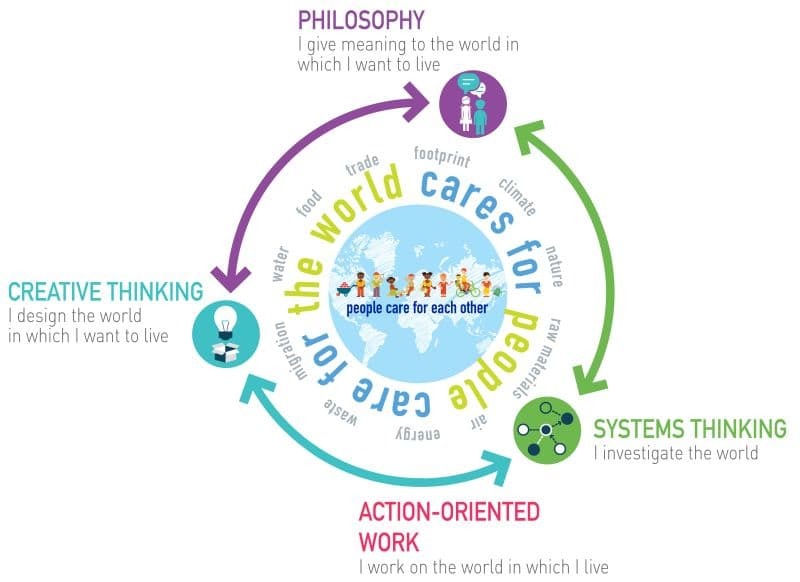 Philosophical thinking supports children in giving meaning to the world in which they want to live: children develop values. To philosophise is to look at the world differently, to look with new eyes and together to give meaning to the world. By philosophizing we clarify concepts. As real philosophers we search together for the essence of an idea or concept and make use of the familiar tools of question and answer! By philosophising, children get to know themselves and others in a different way, and better. Teachers and children give themselves the opportunity to look for answers to questions they would otherwise never have asked themselves. Right or wrong do not exist – and all answers are a contribution. In this way children give their own interpretation to the world. They test their own values and discover and develop new ones. They often adjust these values during philosophical conversations. This helps them in making choices for a sustainable society. As with other thinking skills, it is also important to name, schematise or illustrate our thinking when philosophising. After all, thinking is a process in which we respond to our own or others’ earlier thoughts or insights. The teacher helps to make the children’s thinking visible by observing and listening carefully and by asking specific questions. If a child finds honesty important and has itself given substance to this idea, then this will help determine which ideas it comes up with for a sustainable world. It is interesting to let children think about what is ‘fair’, and to deepen concepts like ‘responsibility’ and ‘solidarity’ in a philosophical conversation. You can philosophize about anything: from a work of art, an exciting article or your environment to the craziest of your own experiences. How do you know that you are reading now? Philosophy creates a bond in the classroom because respect for different opinions is a basic condition. Philosophy sharpens critical thinking in children: nothing is self-evident. While thinking philosophically, children find that they already know a lot. They themselves give meaning to concepts and values, which ensures a higher level of involvement. Philosophy is an exercise in various conversation skills. Children build on each other’s answers, which also activates their attitude to listening. Children learn to formulate their own ideas and opinions clearly, which strengthens their language skills. Philosophy is oxygen for less self-confident children: during a philosophical conversation there are no correct or wrong answers. Philosophy gives children the opportunity to explore for themselves: it stimulates autonomous learning. Philosophising makes children consciously think about values: they develop a value framework that provides a basis for making choices. Including sustainable choices.